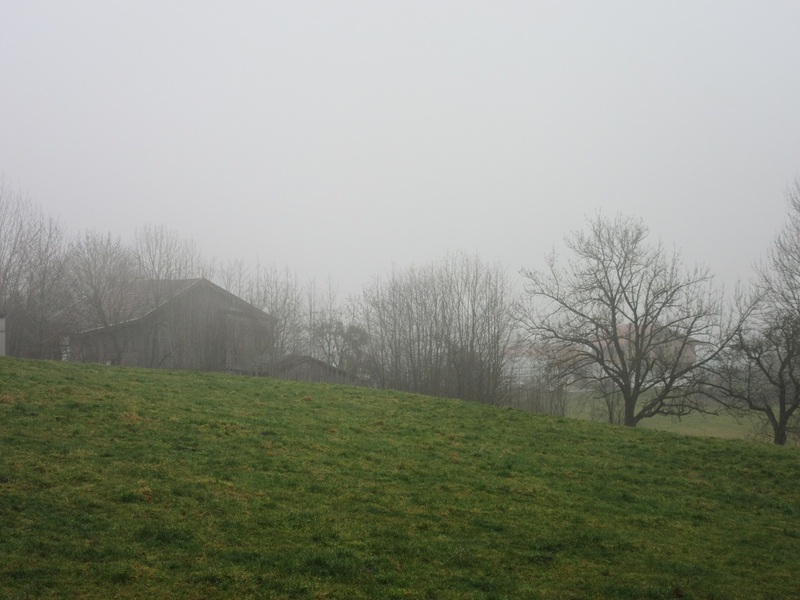 It’s January 9th here in the allegedly snowy Bavarian Alps but, other than an inch that fell last week and melted the next day, we have not seen a hint of that white stuff. What we do have is rain and drizzle and fog and damp bone chilling gray nasty weather. Is that descriptive enough? Do you get a mental image of how yucky the weather is here? This is what I’m talking about. But, I shouldn’t complain. Next week we’ll probably have 3 feet of snow! In other words, perfect weather to be sitting by the wood stove reading, with a pot of tea on the table next to your left elbow. At least that’s the way I’m set up! 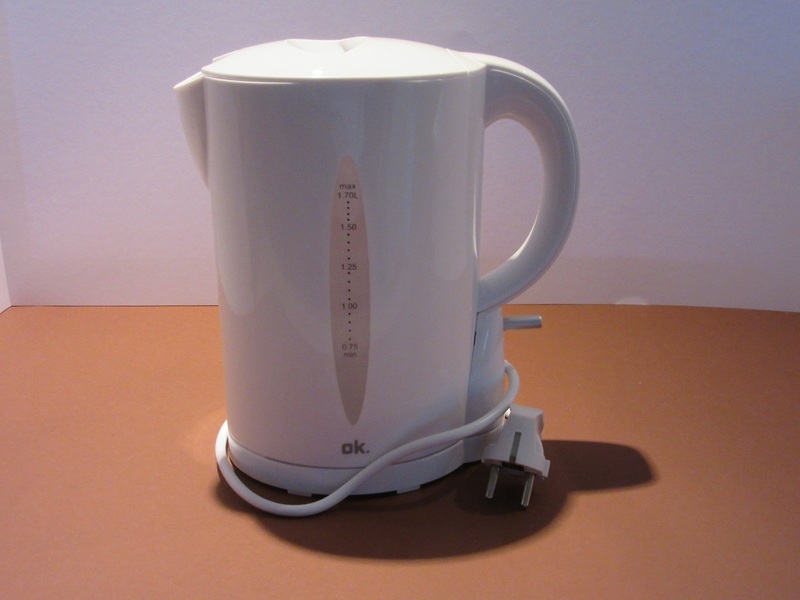 Brewing a pot of tea is easy but unless you’re of the mind set to throw a tea bag in a mug and nuke it in the microwave, there are a few necessary and important steps to follow. The results are more than worth the few extra minutes it takes to make a lovely pot of tea. If you have never tried it, I think you’ll be surprised and pleased with the results. Now, if I only had a fist full of butter cookies, I’d be totally content! 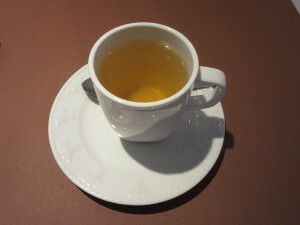 A few days ago, I stopped at the tea shop in Rosenheim to purchase a new supply of Jasmine Tea. The store is Tea Gschwendner. A chain store here in Europe that also has a shop in Chicago. They specialize in quality teas and the variety is astounding! 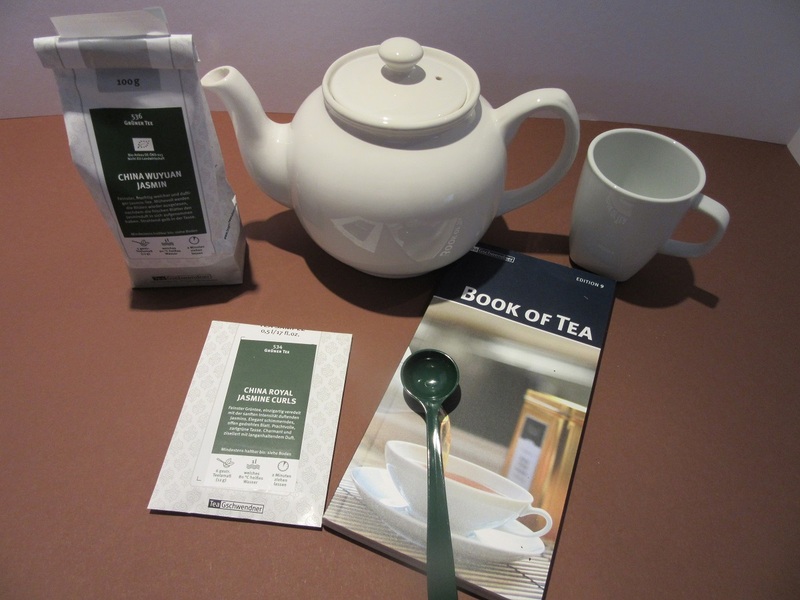 The proprietor presented me with a book about tea which tells all the countries their teas come from and how the various climates affect the taste of tea. I chose one variety of Jasmine tea and she gave me a sample of another kind, plus the measuring spoon. Such service! Yep….she hooked me in and I will go back. OK….enough. Let’s make a QUART of tea. First step is to make sure you have good water. If you’re happy with the water from your tap, that’s fine. 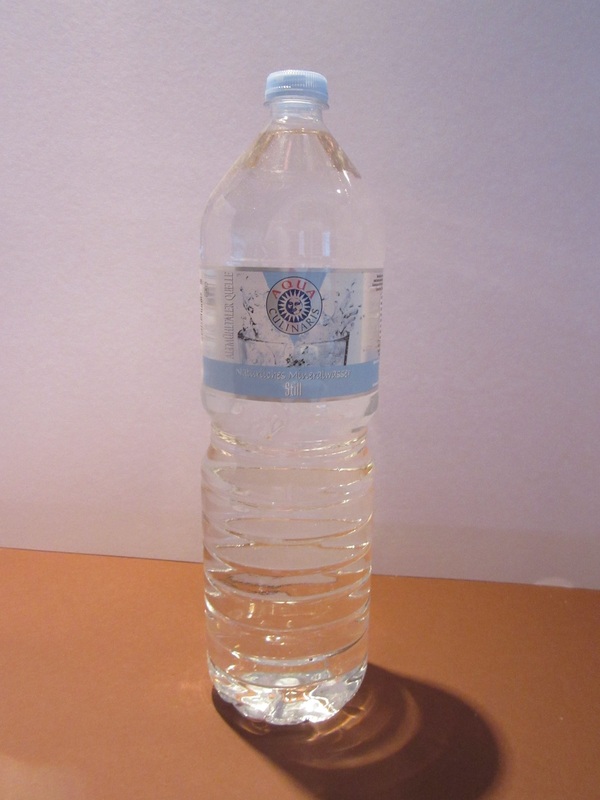 Our water here is treated to remove minerals and the taste is well…..different. Bottled water is the answer for us and as it is 10 cents a Liter, it is well worth purchasing. Next we need to boil water using your favorite pan. Add a little over one quart of water to the pan.I have an electric kettle which I love because as soon as the water comes to boil it shuts off. That’s important! If you keep boiling the water, it ends up tasting “flat.” So just bring it to a boil and remove it from the heat. 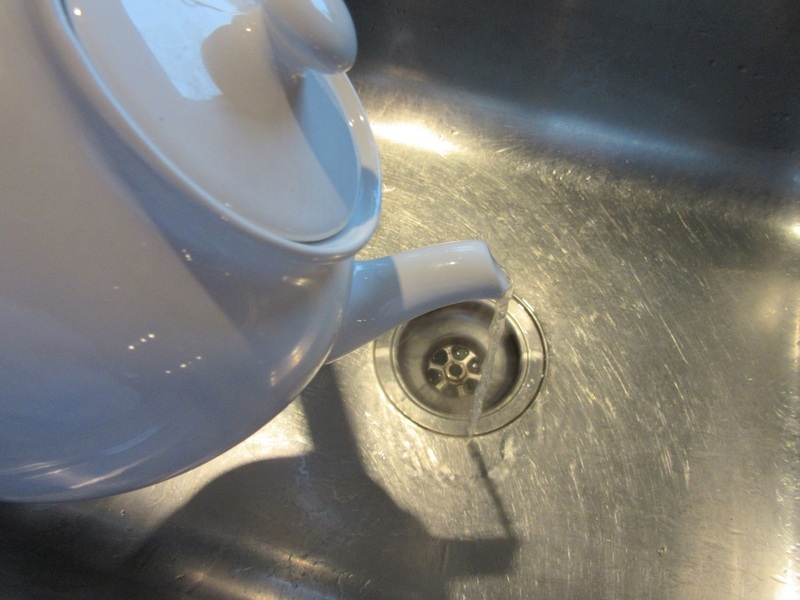 Take your teapot and slosh in a little of the boiled water. Swish it around for a a few seconds to warm the pot then empty it out. 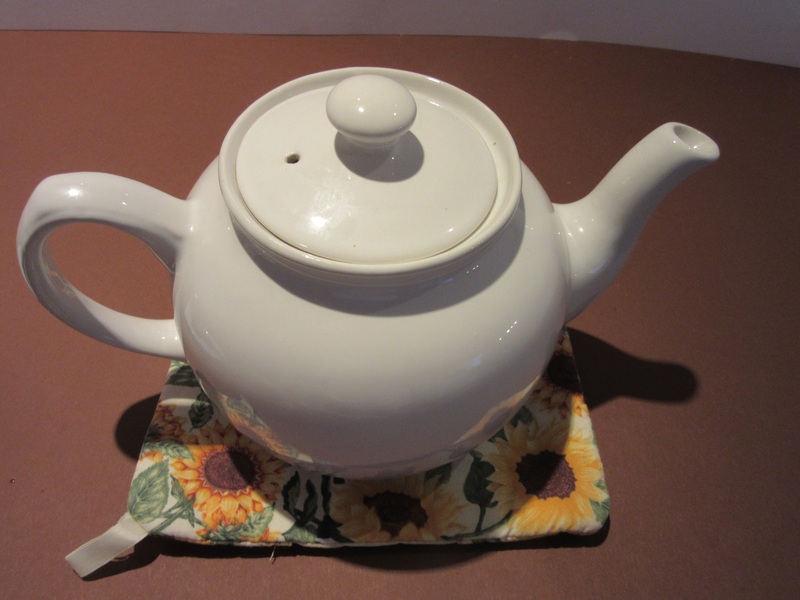 Warming the pot first will help keep your pot of tea hot and your tea leaves won’t be shocked when hit with the boiling water. You don’t want shocked tea leaves. Poor things! I really thought you wanted to see a picture of my kitchen sink. Ha! Now, we add the tea leaves to the bottom of the pot. 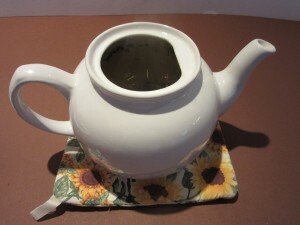 Scatter the tea leaves across the pot. No clumping! I wish I could give you exact measurements for the amount of tea to use, but honestly, tea varies so much, you have to experiment a bit. For my Jasmine tea, I used 1-1/2 teaspoons and it was plenty strong. For Orange Pekoe, the rule of thumb is 1 teaspoon per cup of water and 1 for the pot. Next, add your boiled water. 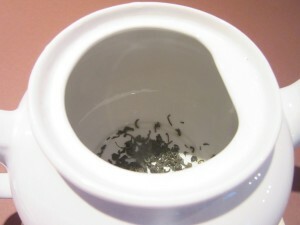 The tea leaves will start to expand and float to the top. No worries, OK? Because as soon as they are fully expanded and soak up the water, they conveniently sink to the bottom! Put the cover on your teapot and let it rest or steep for 3-4 minutes to develop all the flavors and let the leaves settle. That’s it. Pour yourself a comforting cup of tea. Grab a book, a magazine or the tv remote and the heck with the weather! Doesn’t that just look wonderful? One last hint. Taste your tea before dumping in sugar. 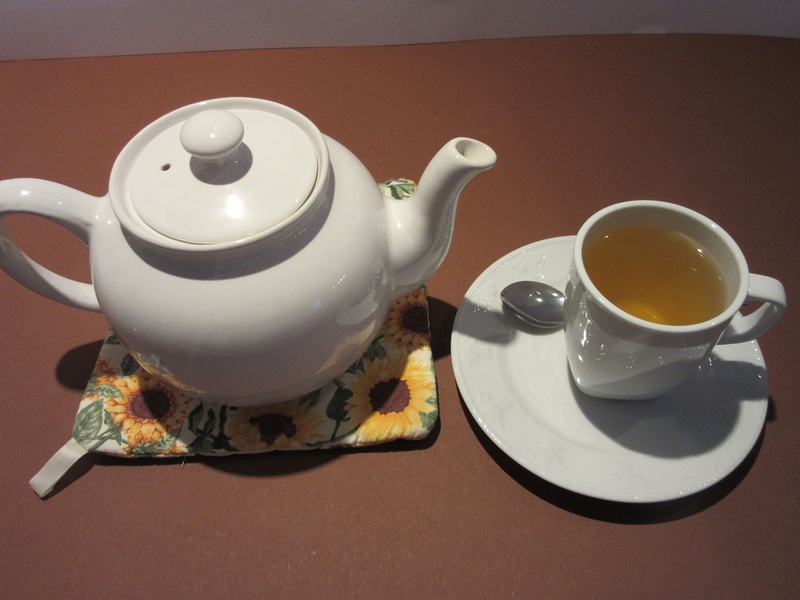 Teas also vary in sweetness and you don’t want to ruin this perfectly lovely pot of tea by making it overly sweet. Now, where are those cookies?